To fight stagnation, start with small habits. Many people find it hard to follow through on their decisions and get out of their comfort zones. 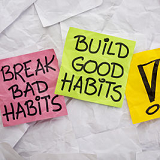 Making small habits is a great way to bring lasting change and improve yourself each day. Understand that people find it hard to change because they want things overnight. Everyone fails at following through with their New Year resolutions because they don’t start with small habits. Identify what you want to change in your life. Then start building small habits to support that change. For example, if you want to build a great physique, start with 15 minutes of exercise every day and then increase this time after one month.